alaTest has collected and analyzed 42 reviews of Vivitar DVR548HD. The average rating for this product is 3.4/5, compared to an average rating of 4.0/5 for other Camcorders for all reviews. Reviewers are impressed by the size and design. The price and portability also get good comments. We analyzed user and expert ratings, product age and more factors. 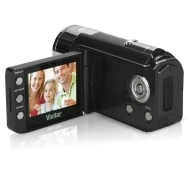 Compared to other Camcorders the Vivitar DVR548HD is awarded an overall alaScore™ of 78/100 = Good quality. alaTest has collected and analyzed 24 user reviews of Vivitar DVR548HD from Amazon.co.uk. The average user rating for this product is 3.2/5, compared to an average user rating of 4.0/5 for other Camcorders on Amazon.co.uk. Comments about the image quality and size are generally positive. The portability and price also get good feedback, whereas reviews are divided on the design. 62% of the reviews on Amazon.co.uk give this product a positive rating. alaTest has collected and analyzed 3 user reviews of Vivitar DVR548HD from Amazon.com. The average user rating for this product is 3.0/5, compared to an average user rating of 3.9/5 for other Camcorders on Amazon.com. Reviewers really like the design. Perfect size to carry everywhere - sound and picture quality excellent and very easy to use. Very pleased so far by what we have seen, appears to tick the boxes for our grandaughter 7 years old. Coupled with a small tripod is fun for recording her dancing and music. Hope she will get good use of it outside the home as the weather picks up. My first camcorder and i am very pleased with it. Sadly, this little beautiful camera has really bad quality, battery life is zero, would not recomend it to anyone, better to buy a camera with rechargable battery. good value for money. runs on aa batteries which last very well. a lovely light weight camcorder ideal for my daughters 13th birthday and she loves it as its simple to use and videos can be viewed on tv. very happy!!!!! pretty good and light weight which is always handy.